PROJECT OVERVIEW-PURPOSE: IT'S TURKEY TIME! AND WHAT COULD BE MORE FUN FOR KIDS THAN MAKING A SILLY-LOOKING TALL TURKEY? This FREE "Easy-Art" lesson plan provides the children with a fun cut and paste holiday activity. The directions are basic, can be done as quiet seat work, and provide small muscle development and exercise. 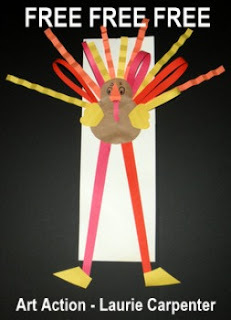 A great follow-up activity is to have the children write or tell a story about their "tall turkey". (Choice based on age of group doing the project.) Please take time to rate this product...thanks! Afterward, sharing creations will give students social interaction, as well as observation of other original ideas.